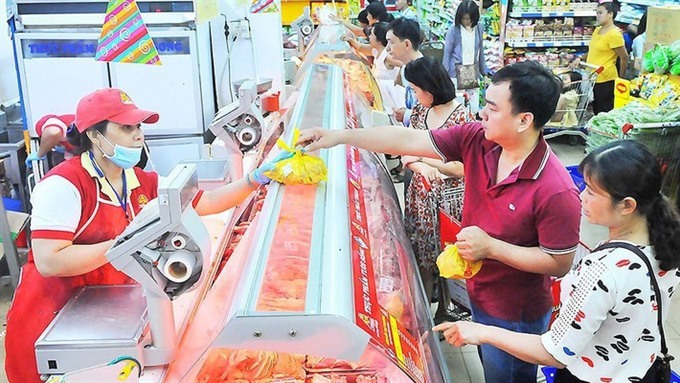 HÀ NỘI — Việt Nam’s consumer price index (CPI) in April went up by 0.08 per cent monthly and 2.75 per cent annually, pushing up the four-month figure by 2.8 per cent year-on-year. This was reported by the General Statistics Office (GSO) on April 29. Among 11 commodity groups, six saw price rise, including transportation (1.18 per cent); housing, water and electricity supply as well as construction material (0.18 per cent); household equipment and appliances (0.09 per cent); culture, entertainment and tourism (0.08 per cent); education (0.06 per cent) and medicines and medical services (0.02 per cent). Lower prices were recorded in food and catering services (0.18 per cent), posts and telecommunication (0.08 per cent), other goods and services (0.02 per cent) and apparel, headwear and footwear (0.01 per cent). Beverage and cigarette prices remained the same. Đỗ Thị Ngọc, director of GSO’s Price Statistics Department, attributed the CPI’s hike in April to higher domestic and exported rice prices, fuelled by higher demands in China and Southeast Asian countries. Petrol prices were also adjusted up, thus pushing CPI by 0.11 per cent, she said, adding that flight and railway ticket prices moved up by 0.76 per cent and 2.55 per cent, respectively. Meanwhile, prices of housing material, electricity and water supply rose by 0.5 per cent, 0.14 per cent and 0.42 per cent, respectively. Prices of poultry and aquatic products, however, curbed CPI growth due to abundant supply. Gold prices moved up by 0.47 per cent month-on-month, while the US dollar rates were kept stable at some VNĐ22,790. According to GSO, basic inflation (CPI exclusive of foodstuff, fresh food, energy, healthcare and education services) in the first four months of this year stood at 1.34 per cent, reflecting a stable monetary policy.